Identify common elements and opportunities in your niche by comparing up to four advertisers, side by side. You can compare Ad Types, Countries, Traffic Sources and Ad Networks used by Advertisers. Start by clicking on the "Compare Advertisers" button in the top left-hand corner. Once you are on the Advertiser Comparison page, you'll see that there are two boxes to enter advertisers. Want to compare three or four advertisers? Click "add another advertiser"
Once you've entered the Advertisers domains, click "Compare Advertisers"
Quickly compare the desktop, mobile and native breakdown for each advertiser side by side in a stacked bar chart. This takes into account relative impressions for each ad type. TIP: Ad Type Breakdown Chart will respond to any changes to the filter other than ad type. Filter by Ad Network, Country and Time Frame (in red below). Statefarm.com has the highest share of voice, followed closely by geico.com. Geico.com and statefarm.com are using desktop and mobile, while progressive.com is the only advertiser using desktop, mobile and native ads. This will show the country breakdown for each unique advertiser for the ad type, ad network and time frame you have selected. You can see which countries are common among advertisers and identify new market opportunities. TIP: Country Breakdown charts will respond to any changes to the filter other than Country. Filter by Ad Type, Network and Time Frame (in red below). All three advertisers have only been seen in US via desktop advertising, on all networks and in last 30 days. If there were any other countries we saw them running ads in, they would be shown here. The Traffic Sources chart will make it easy to see which sites are being used by all advertisers, some advertisers or only one. WhatRunsWhere provides scoring to show relative volume for each advertiser on each site. TIP: Traffic Sources table will respond to all changes to the filter. Filter by Ad Type, Ad Network, Country and Time Frame (in red below). Ad Strength Rank of how frequently the compared advertisers appeared on this site, in total. In the example ebay.com is the site that received Ad Strength Rank 1 (in blue above). This indicates that ebay.com had the highest number of cumulative frequency from all 3 advertisers. What about the scores below each advertisers name for each site (in yellow above)? This score goes from 0.1 to 100.00, 100.00 is the highest score. This shows how frequently that specific advertiser appeared on the site relative to the other sites for all advertisers compared. In the example above for ebay.com, geico.com has a score of 100 (in yellow). This indicates geico.com advertising on ebay.com had the highest relative frequency on all sites for all three advertisers. Progressive.com advertising on ebay.com had a relative frequency score of 59.6. Statefarm.com had a relative frequency score of 0.1 on ebay.com. Compare and contrast the channel breakdown for advertisers. Identify Ad Networks being used by the competitors you select. We show percentages based on relative volume so that you can see which Ad Networks are being used the most by each Advertiser. TIP: Network Breakdown charts will respond to any changes to the filter. Filter by Ad Type, Network, Country and Time Frame (in red below). 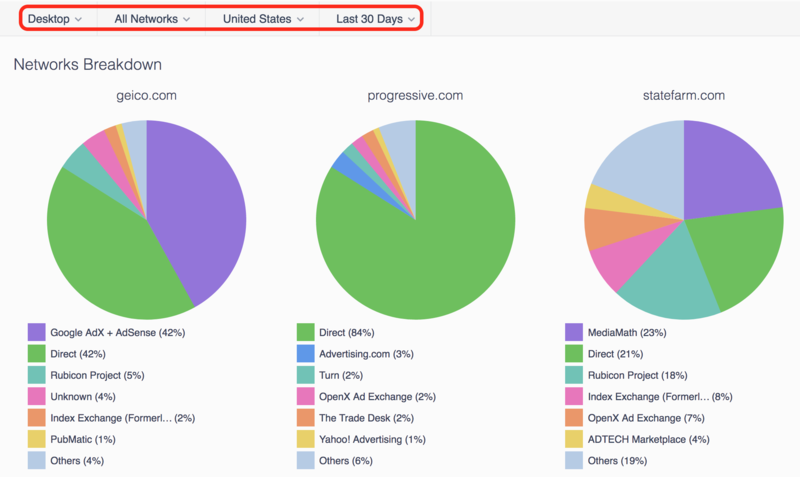 Both geico.com and progressive.com are running a substantial amount of their ad spend via direct ad buys on sites. Geico.com is running 43% direct and progressive is running 82% direct buys. While statefarm.com is running only 20% Direct.